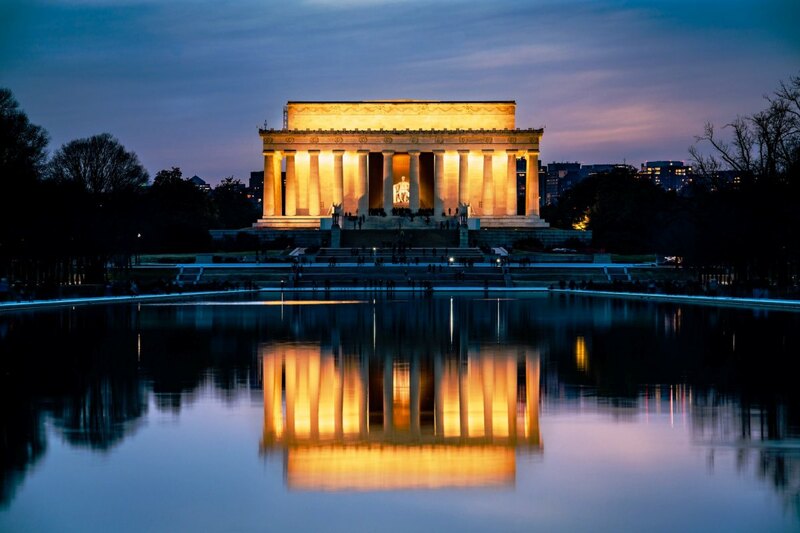 Traveling across the continental United States is quickest by plane and more economical by car. Making the trek by train, however, is the most magnificent way to see beautiful country from a totally different perspective. The California Zephyr is Amtrak's line spanning from Emeryville, CA to Chicago, IL. The most scenic stretch of the ride occurs between Glenwood Springs, CO and Denver CO when the train travels through beautiful high country. There is one train traveling eastbound per day, and one running westbound. Heading out of Glenwood Springs, one of Colorado's mountain resort towns, towards the state's capital, the train tracks take passengers through five spectacular canyons and more than 30 tunnels, crossing back and forth over the Colorado and Fraser Rivers before reaching Denver. No matter what time of year it is the six hour ride is absolutely beautiful to see. The train makes two stops along the way in Granby and Fraser, the home of Winter Park Ski Resort. 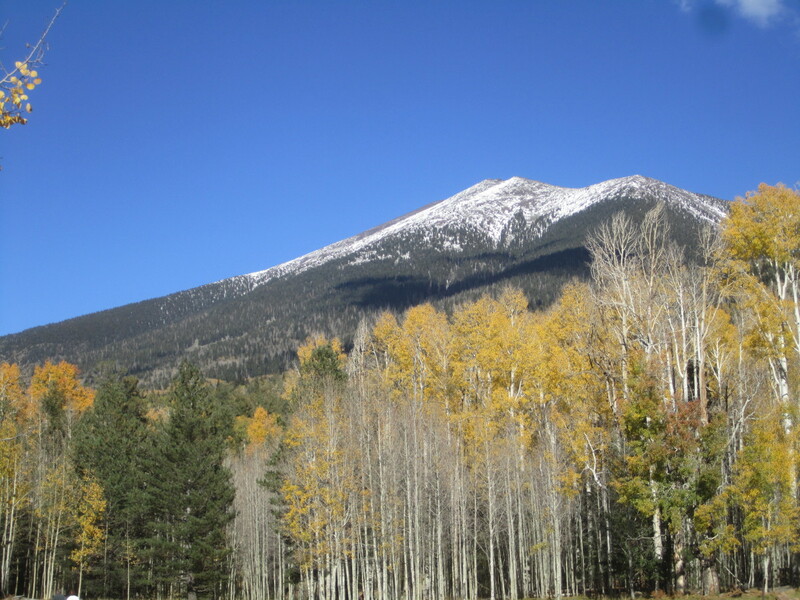 I would imagine that making this journey in late October, when the Aspen are changing colors, would be just as beautiful as taking the trip in the winter when snow is on the ground. 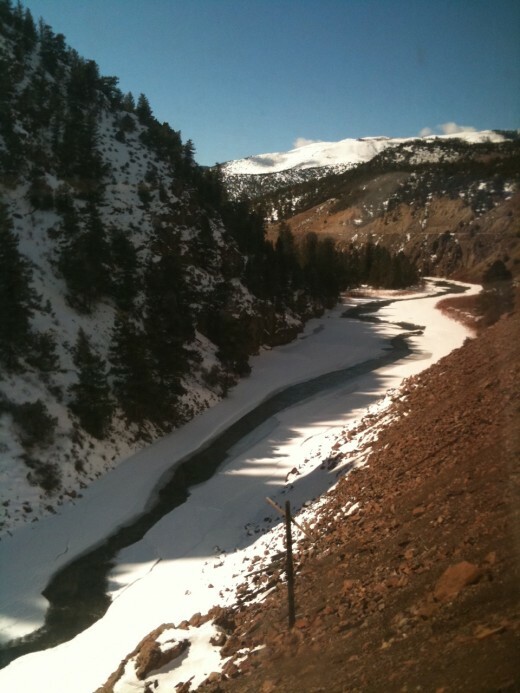 I took this Amtrak journey on February 21st, 2011, from Glenwood Springs to Denver, to see for myself how wondrous the landscape could be. My eyes were glued to the canyon walls and river below through the entire ride. Aside from a quick trip to the lounge car for a bite to eat, I was mesmerized by what I saw out the window of my coach seat. The canyons and towns described in the remainder of my hub chronicles my journey with some added facts woven in for informational purposes. The California Zephyr leaves the Glenwood Springs train station heading east through Glenwood Canyon. 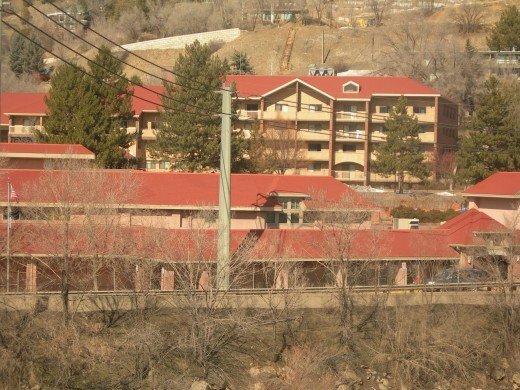 The station is directly across the river from the Yampah Hot Spring which feeds into the Glenwood Springs Pool. This pool is a favorite hang-out spot for tourists and locals alike. Teddy Roosevelt used to come to the pool for rest and relaxation while staying at the Hotel Colorado. His trips would bring him into the woods to hunt. Soaking in the hot springs pool after hunting was the right prescription for anyone, let alone the President. 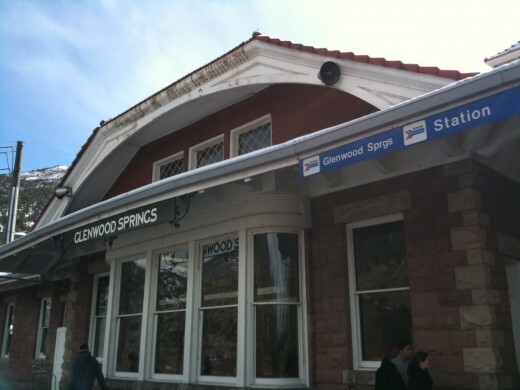 Glenwood Springs was also the last home of Doc Holliday, the Wild West legend. He spent the last few months of his life in Glenwood before passing away. Today, many people enjoy Glenwood Springs for its many outdoor, recreational offerings, including biking, hiking, skiing, and whitewater rafting, to name a few. As the train heads into the canyon, there is a wall of rock on the south side of the tracks, and a river running along the north side. Beyond the river is Interstate 70, a split highway that runs through the canyon as well. At the right time of day, both elk and bighorn sheep can be found feeding in the canyon. There are also plenty of fishing holes and spots along the river which can be accessed via the biking/hiking path. During the spring, when the river is raging with melted-snow run-off, the bike path has been known to be under water. The rock walls on both sides of the canyon are majestic. At several areas in the canyon, the walls come together pretty closely. The river narrows, the highway lanes are one above the other, and the train tracks seem like they are barely hanging on to the edge. Dotsero, CO is a small town on the far western end of the Eagle River Valley where the Colorado and Eagle Rivers become one. The town got its name from survey team members who used to mark the spot where the two rivers joined with a dot and a zero (.0). Dotsero also marks the approximate mid-point of the Caifornia Zephyr's route from California to Illinois. At this point on the train ride, the tracks make a turn and the California Zephyr starts to head north as it follows the Colorado River. Passengers can see the Colorado River Road, which quickly becomes dirt as it follows the river on the opposite side of the train tracks. Approximately 15 minutes after the northbound turn in Dotsero, the Amtrak took passengers through Red Canyon, one of the more colorful stretches of this route. 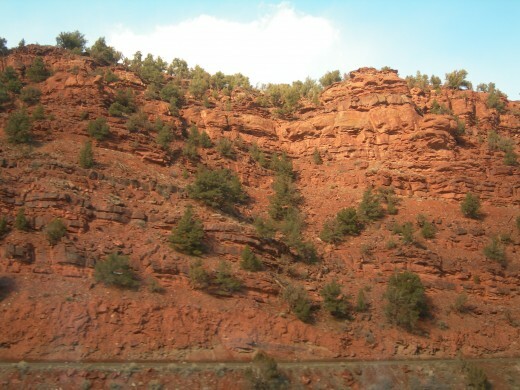 The Red Canyon boasts unusual rock formations and layers or orange-red rock sprinkled with evergreens hanging off the edges. It is even prettier right after a heavy snow-fall when the tops of the trees and rocks are covered with white snow. 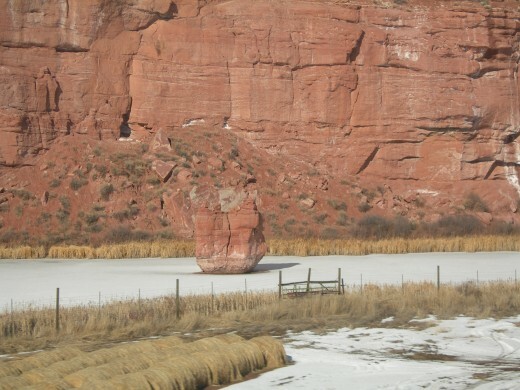 The colors in these rocks inspired natives to name this state and river, Colorado, meaning "reddish color." As the train leaves the high-desert feel of the Red Canyon and enters the alpine-feel of the Gore Canyon, the landscape seems to change dramatically. Red Canyon's steep, red walls, stacked high with layers of red rocks turns into Gore Canyon's steep, but gentler slopes with larger, brown rocks and significantly more snow. 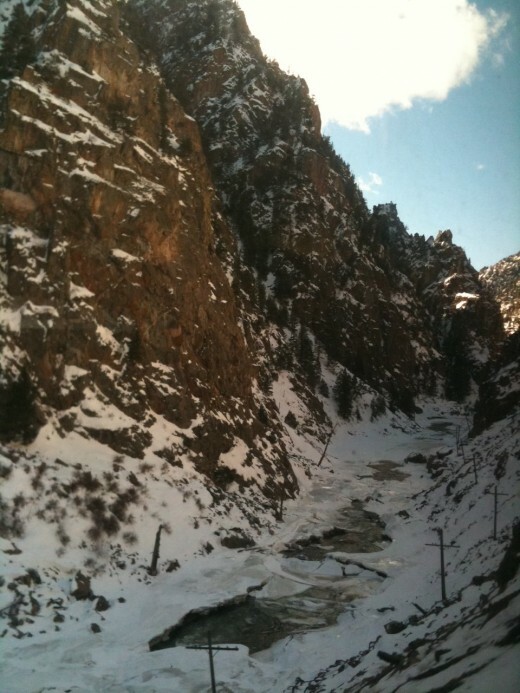 Through Gore Canyon, much of the riverbed is frozen over and covered with snow. Winter is definitely a pretty time of year for this ride. Every so often, there is a crack or hole in the ice and evidence of the river running underneath is revealed. Most of Gore Canyon is roadless. There are two ways of getting through: train and kayak, although the river cannot be followed the entire way by vessel as some areas are not passable. During the summer time, a segment of the river offers Class V whitewater rafting, which is the wildest stretch of river that is floated commercially. 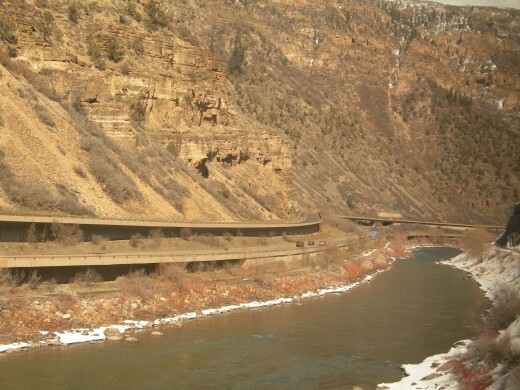 The Amtrak follows Gore Canyon for 22 miles. Between Gore and Byers Canyons sits the town of Kremmling, 70 miles away from Vail, CO, home of the world-class ski resort. Founded in 1881, this slow-growing town's population has remained under 2,000 due to the lack of mineral resources in the surrounding areas. In other words, there was nothing to mine. Ranching has become the industry that feeds Kremmling today. Beyond Kremmling, heading eastbound, the California Zephyr ventures through Byers Canyon following the Upper Colorado River. Byers Canyon is filled with pagoda-shaped rocks that have eroded from water and strong winds over the centuries. The rocks are spectacular through this stretch of the journey as they stick straight up, high above the river and railroad tracks. After the Amtrak leaves Byers Canyon's walls behind, it comes to its first stop in Granby, CO. Granby is known as "The Gateway to Rocky Mountain National Park." A region called Middle-Park can be seen from the train with its vast meadowlands and grazing cattle. The train makes a quick stop here, but just long enough to drop off and pick up passengers. There is no time for a stretch break just yet...not until the train gets to Fraser. As the train leaves Granby, it starts to follow the Fraser River through Fraser Canyon. This remote canyon provides people with some of the best fishing spot or holes in North America. There are a variety of trout in the river, including rainbow, brown, and cutthroat. 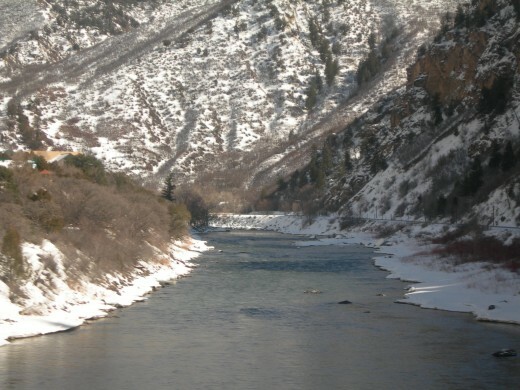 Fraser Canyon was President Eisenhower's favorite place to fish. After venturing through Fraser Canyon, the California Zephyr stops in Fraser, CO for approximately 10 to 15 minutes, depending on how "on-time" the train is running. Here during the winter season, day skiers from Denver get on the train to head back home after a day of skiing in what's known as the "icebox of America." 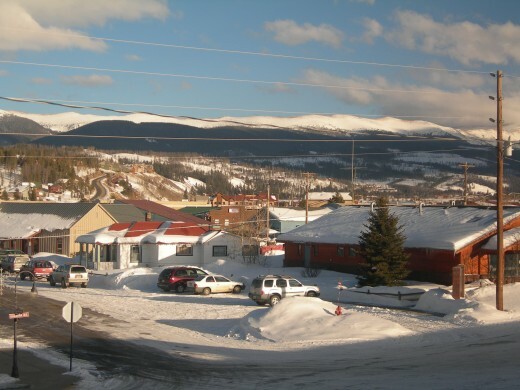 Winter Park is the ski area at the eastern end of the town, just before Moffat Tunnel. Some of the ski runs end right alongside the railroad tracks. Temperatures in this area can reach -50°F during the winter. Right after the train passes the ski area, it enters Moffat Tunnel which is 6.2 miles long. 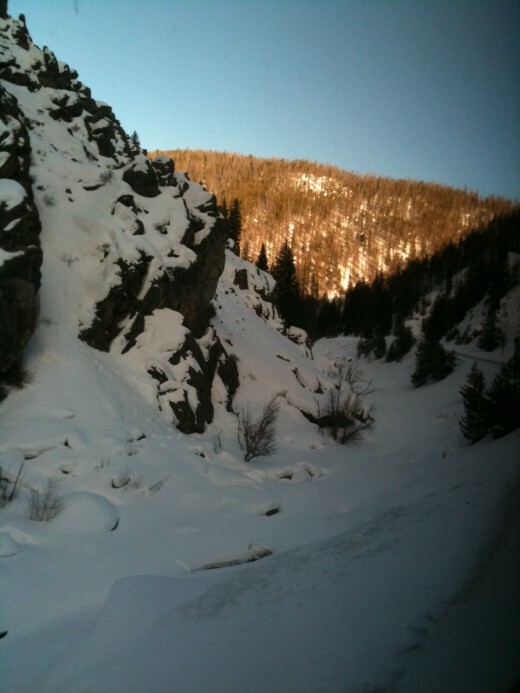 This tunnel was dug to shorten the distance between Fraser and Denver as it allowed the train to travel through less switchbacks and steep tracks over Rollins Pass. The tunnel was opened in 1928, cutting the distance between Denver and the Pacific by 176 miles. The tunnel is the point where the train crosses over the Continental Divide. Moffat Tunnel marks the beginning, at this point, of a string of tunnels the train travels through as it descends into the Denver area. In all, we went through 29 tunnels, with the longest being the Moffat Tunnel and the shortest being a mere 48 feet. I like to call the plains beyond the foothills "the flatlands." A brown haze can be seen as the train traverses the mountainside and starts to descend south into the flatlands along South Boulder Canyon. During the descent, looking out the windows, I see rock wall on one side and a drop-off on the other. The path is narrow as the train travels through the tunnels along the canyon wall. I find it interesting that the descent into the Denver area begins with the tunnel-filled route along South Boulder Canyon. 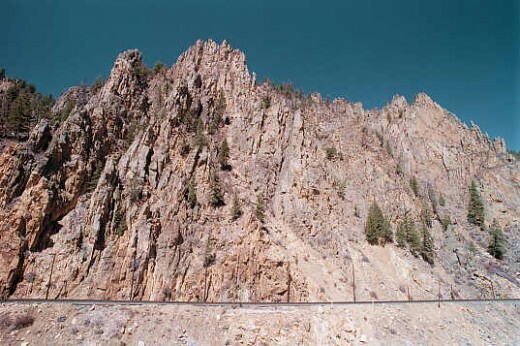 Unlike the other canyons on this journey, South Boulder Canyon only has one side of rock wall. It was more like coming down a mountainside via switchbacks and tunnels rather than traveling through a canyon. At this point on the journey, the sun is started to set and the colors in the sky were absolutely gorgeous. Again, traveling during the winter allows you to experience this. During the summer, the sun doesn't set until a couple hours later. It was getting close to 5:30pm on this cold, February day. 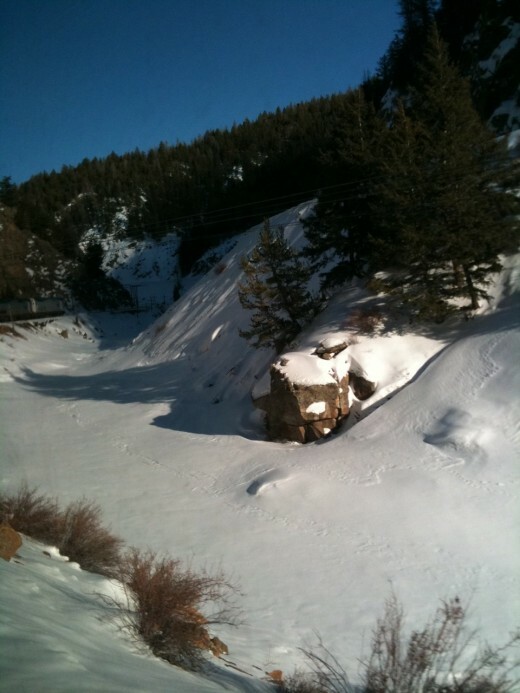 After the Amtrak train emerges from the rocks, it starts its journey on the flatlands by passing an area of the route named Rocky. The train navigates its way through a large bend called the "Big 10 Curve" as it approaches the Denver suburb of Arvada. This particular area gets high winds on a regular basis. To combat the winds, railroad worker left some extra train cars filled with sand on the neighboring track to help break the wind. These particular sand-filled hoppers are welded to the rails for stability. As the train approaches Denver, the city lights take over. The ride was coming to an end for me as we reached the Union Station area. Union Station, in Denver, CO is extremely convenient for short-term visitors like myself. I was able to find great lodging and food on 16th street mall, right off Union Station. A free shuttle provided me with the necessary transportation for a couple days before I hopped back on the train and went on the return trip on the California Zephyr. Heading westbound was interesting as well. The train leaves Denver in the morning, giving all the scenery a fresh look as I visited the towns and canyons again, this time in reverse order. Denise: You'll have to add this portion of the Amtrak trip to your "Things to do in Colorado" for your next journey through the west. It is absolutely gorgeous! Thanks, again, for reading my hub. Your hubs are always so interesting b/c you fill them with so much information. I really enjoyed reading this. I've been on the amtrack before but it was decades ago. I can only imagine how fun this would be. Thanks.